Arrived Brisbane Intl; had to admit to customs that I'd never taken my video camera underwater before, and therefore could not, under any circumstances, be considered a Pro. Bought a mobile phone for AUD$10. Works better than mine at home, but then I haven't repeatedly hurled this one against steel tanks yet. Stay tuned. Caught a cab to pick up our Wicked Camper Van. Our cabbie was a Philipino who used to live in Toronto. He had lots of opinions. The moment we arrived at Wicked, Justine knew which camper was ours. All the Wicked vans are painted with large murals. They are known by their murals. The subject of our van, our home-away-from-moth for 2 months was a person who shared Justine's birthday. Jimi Hendrix. 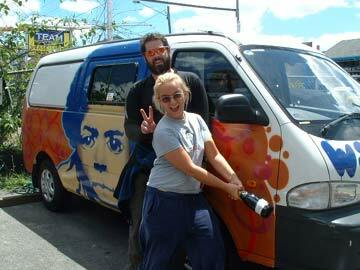 Yes, we're spending the next 2 months driving around in the Hendrix-mobile. The driving itself is worth mentioning. Aussies drive on the left. And as Justine points out, it's only polite that we do too. I spent about 10 days doing this in the UK 6 years ago, so I have an idea, but it takes lots of concentration nonetheless. Justine navigates and I keep us on the left. It's kind of like the Speed Racer episode. I'm Speed and she's Racer X. On our first left turn, I end up in the wrong lane. Doh! A minute later folks are thronging in the street yelling and waving arms at us. We were on full paranoiac alert until we realized they were cheering the Hendrix-mobile. Whew! We had gotten some intel that if we paid parking we could make the South Bank our home for a while. This turned out to be untrue, but in the course of buying an ochre-stained shirt, we met a crusty old fellow who suggested parking at a ferry parking lot just south of the city. It was a nice park itself, beautiful and quiet. Our first night down under. Only 58 more to go.